The Mi router 4A Gigabit Version supports two frequency bands of 2.4 GHz and 5 GHz reaching up to 1167 Mbps, made from environmentally-friendly matte plastic material and equipped with four external high-gain antennas. It also features an MT7621A MIPS 880MHz dual-core four-thread processor and 128MB large memory and stably connect 128 devices, smartly managing the network via MiWiFi app. – Integrated with PA (power amplifier) and LNA (low noise amplifier)enhances the signal transmission power and sensitivity. 1. Search and download the APP “Mi Wi-Fi” on Google Play or App Store. 2. Powering the router, and open the WiFi (on the phone) to connect the Router. 3）Click “More Options”, finish the primary base station (set up a new network name and password). 4. Open the APP, complete your WiFi setting. 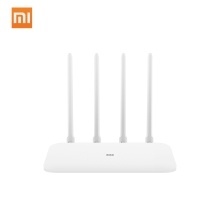 The APP supports Chinese and English ONLY, and the Xiaomi Mi WiFi Router 4A is Chinese version.